We are thrilled to announce the release of the Moira Hughes wedding stationery line, launching today in collaboration with Paperlust. Now you can bring the Moira Hughes aesthetic to your wedding in a whole new way, perfectly complementing your custom gown. Our wedding gowns are more than just an item of clothing: they carry so much meaning and emotion. We wanted everything that a Moira Hughes dress brings to a wedding to be captured in the stationery line too: the feeling of love and excitement, beauty, femininity and sophistication. When you choose your wedding gown you want it to feel like a dream: we wanted the same thing for people choosing their wedding invitations. After all, both your dress and your invitations will be treasured mementos of the big day for the rest of your life. To create these beautiful pieces Moira was able to work with Paperlust’s talented print design team to bring her ideas to life on the page. Paperlust is an Australian online marketplace that puts design lovers in touch with the best designs from Australia’s most talented independent designers. Paperlust are Australia’s print design experts and they’re all about supporting the local creative community, so we couldn’t have asked for better people to collaborate with on this. To create the designs we started with an inspiration board filled with luxe colours, textures and combinations that evoked the perfect emotion. Moira also wanted the collection to be personal to her, so she drew inspiration from her own wedding and the elements she loved most. From there it was a matter of narrowing down the colour palette, paper stock, and typefaces that best represented the ideas we were looking to incorporate. We opted for a black, blue, gold foil and ivory colour palette and incorporated white ink, watercolour washes, foil detailing and translucent paper to create texture. Playing with ink and paper is a whole different ballgame to using fabric, but we wanted the effect to be similar and equally as luxurious. The final product is all about texture and layers that create a full sensory experience for guests when they receive their invites. It is sophisticated and regal while also being completely feminine, bringing together soft script fonts and delicate colours with bold features like gold foil and a splash of bright blue. 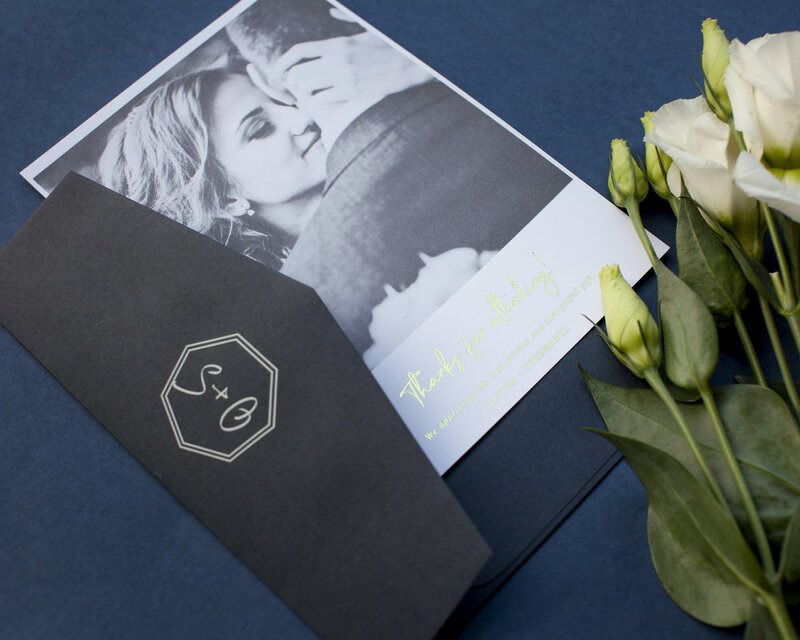 The finished stationery line includes save the dates, wedding invitations, RSVP cards, thank you cards, information cards, menus and other key elements, to make sure the bride and groom can communicate everything they need to with their guests. The cards can be mixed and matched to meet your own needs. Envelopes and belly bands finish the whole package off in style. We hope you love the finished stationery as much as we loved creating it! The process was so much fun, and the finished product is everything we imagined and more. A big thank you to Paperlust for making this such a great experience! The set is available to purchase exclusively on Paperlust. Be sure to head over and check it out! To receive a 10% discount on any range sold at Paprtlust enter the code MOIRAHUG632 at check out.